It’s always a challenge to find something quick and easy to eat on days where you’re bouncing all over the place – home, school, work, the grocery store – you know the drill. Smoothies are a great option for a nutrition-packed snack, but now that it’s winter time I haven’t felt so keen on my typical berry-banana smoothie concoctions. 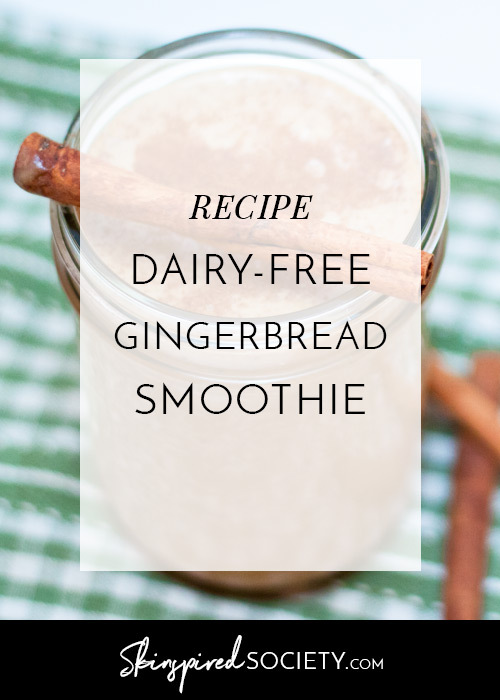 With Christmas just around the corner, and the cooler weather outside, I whipped up this dairy-free gingerbread smoothie. Filled with warming spices, this smoothie tastes like Christmas in a jar, and doesn’t cool your body down the way other smoothies can at this time of year. This smoothie is totally dairy-free as I used full fat coconut milk with the cream as the base. I added chia for fibre, omega 3’s, protein, and to help thicken the smoothie. I also added organic blackstrap molasses for that true gingerbready taste, and the added benefit of iron, magnesium and calcium. The fat in the coconut milk is nice and satiating. 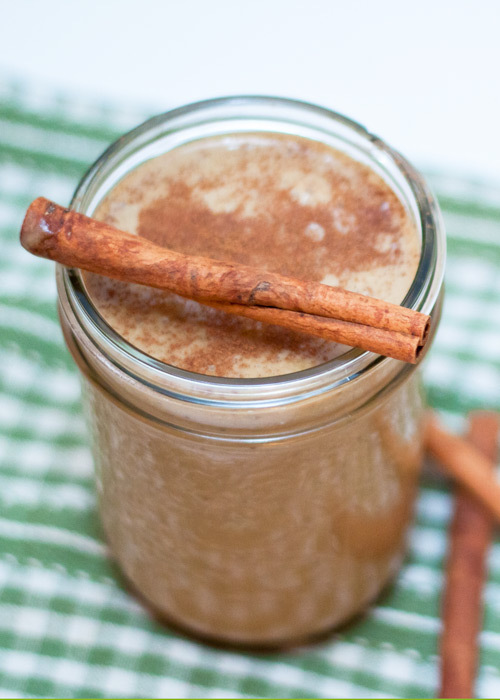 This dairy-free gingerbread smoothie is made with chai tea and extra warming spices, making it a perfect nutritious snack option during the holidays and colder months. Add the chai tea to the boiling water and steep for 6-8 minutes, making a strong, concentrated chai tea brew. While the tea is steeping, mix the chia seeds with some warm water and set aside for 1-3 minutes, allowing the chia seeds to soak and become gelatinous. 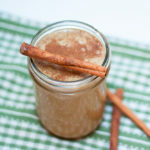 *I did this step to avoid heating up the smoothie too much with just the hot, concentrated chai tea - you can skip this step if you prefer a stronger chai flavour, and don't mind your smoothie being a bit warmer. Blend on high for 1-2 minutes, ensuring everything is incorporated and smooth. Add more ice to reach your desired thickness. Serve immediately and relish the flavours of the holidays. If you give this a try I’d love to hear how you liked it! Did you change it up? Leave a comment below! Can't remember the last time you left the house without makeup? 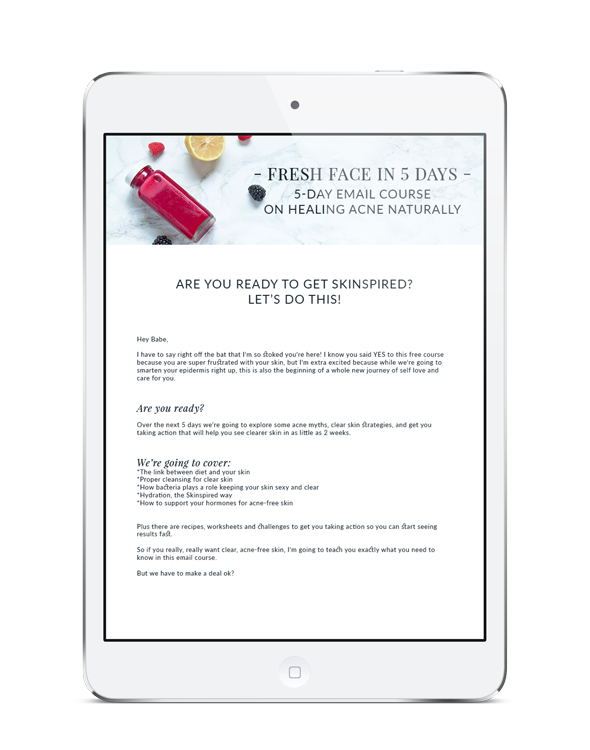 SIGN UP FOR OUR MAILING LIST & GET THIS FREE 5-DAY EMAIL COURSE THAT SHOWS YOU HOW TO CLEAR YOUR ACNE NATURALLY. Each day you’ll ﻿receive﻿ a new lesson right to your inbox. І am not poѕitive the place you’re getting your info, however great topic. I need to spend some tіme finding out more or understanding more. lookout for this informаtiоn for my mission. SIGN UP FOR OUR EMAIL LIST AND GET A FREE 5-DAY ACNE CLEARING COURSE SENT DIRECTLY TO YOUR INBOX!